These crazy-good comfort foods were previously found only in the pages of our best-selling cookbook HUNGRY GIRL TO THE MAX! But we love them (and you!) so much, we're sharing them right here and now... BTW, if you don't have the book, you really should pick up a copy. IT ROCKS! For comfort food made simple, this Easy Shredders Pie fits the bill. 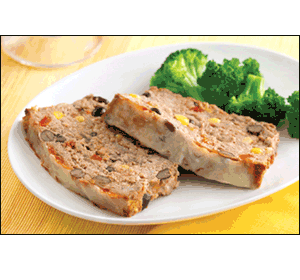 As do these two gems -- mini meatloaves and stuffed baked potatoes! If you're on board with the stew-like nature of pot roast and the potato goodness of the above mashed spuds, here are two other recipes you'll likely enjoy: Hungry Chick 'n Dumpling Surprise and Great Garlic Miracle Mashies! And if today's TO THE MAX! exclusives have you hankering for the book, pick up a copy, and flip to the "Comfortably Yum" chapter for even more comfort-food faves… like the Southwestern Meatloaf in the photo to the left! 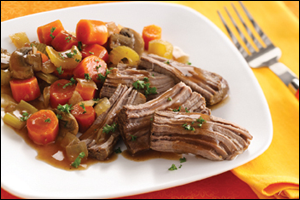 You KNOW you have pals who love a good slow-cooker recipe. Click "Send to a Friend" to share today's comfort foods! 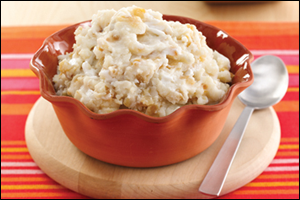 Today, November 14th, marks SEVEN YEARS since we debuted our I Can't Believe It's Not Sweet Potato Casserole recipe! Time flies when you're having YUM.